If you are looking for the right Annapolis emergency plumber, look no further than Heidler, Inc. Call us today at (410) 268-7191 for immediate service. Click here to access our latest specials and take advantage of savings. Have you ever faced a burst pipe at three in the morning? If you have, chances are it’s something you would not want to experience again. Let Heidler, Inc. take care of all of your urgent plumbing issues. 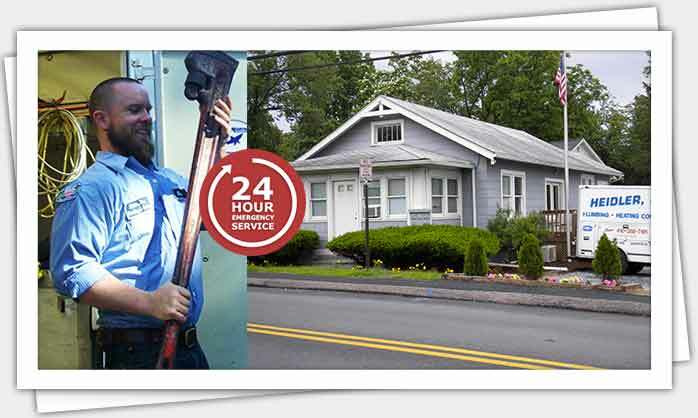 We are your local Annapolis emergency plumbers ready 24/7 for any surprises thrown your way. With live help just a phone call away—whether it’s three in the morning or three in the afternoon—you will never be alone when facing the unexpected. Curious to see what other customers are saying about our services? Click here to visit our reviews and testimonials page. Have a burst pipe emergency? Burst pipes can cause significant water damage in a short period of time. They often occur during the winter, when pipes are likely to freeze. Frozen water expands inside the pipe, and the constant expansion and contraction can be too much for the pipes, causing them to burst. Electrocution: If the water inside your walls reaches any electrical outlets, wires, or your electrical box, there is a risk of electrocution. Water damage: Burst pipes can lead to water leaking throughout your home, causing severe damage to the walls and ceilings. Costly bills: Along with damaging your property, a burst pipe can also spike up your water bill. This is especially true with minor pipe bursts, which can go unnoticed for some time. Mold: Due to the amount of moisture created from a burst pipe, mold can begin to form. This can cause further health problems. Call us immediately if you notice any signs that a burst pipe has occurred. We will repair or replace your pipes and prevent as much water damage as possible. How can sump pumps prevent unexpected problems? Sump pumps can help prevent flooding in your home. They are installed in the lowest area of a basement or crawl space and use drains to make sure water travels away from your home. We can install a new sump pump for you to keep your home safe during heavy rains, or we can repair your existing unit. A sump pump helps prevent water damage caused by flooding, so make sure you have one installed to keep your home dry. Severe toilet clogs can lead your unit to overflow. To prevent this problem, be mindful of what gets flushed on a regular basis. Avoid flushing excess toilet paper and other items that are difficult to break down. If there is a clog farther in your sewer line, we will need to remove it before it causes your drains and toilet to overflow. If regular drain cleaning methods are not enough, we will discuss hydrojetting options with you to make sure your sewer line returns to normal as quickly as possible. No matter what plumbing emergency you are facing, call on the experts who guarantee top quality care. Contact us at (410) 268-7191 for immediate service.